Gotterdammerung is the "last night" of the four evening Ring Cycle. It's the most epic of the four operas, both thanks to the exceptionally powerful music and the plot which depicts the fall of heroes, gods, and the entire world. Singers are usually pretty tired by this point, but they have to survive another 4 hours of powerful music and drama! In my opinion, Gotterdammerung alone is one of the greatest achievements of humanity in any art form. This 'twilight' is basically the complete annihilation of the Gods in the world of the Ring Cycle. The general theme of this opera is self-sacrifice and redemption because of love, which of course has to finish with the world ending. It's a philosophical finale to Wagner's masterpiece. Wagner had written the text well before the music. "Completed in Wahnfried on 21 November 1874. I will say no more!! RW"
Prologue: The opera opens with three Norns (bizarre witch-like sightseers) weaving a rope around some rocks. It breaks, meaning they can't tell the future any further. They become terrified and confused, and run away to Erda, goddess of the Earth. Meanwhile, Siegfried and Brunnhilde pick up where they left off in the last opera Siegfried. It's dawn, and they hail their hopeful new beginning. Siegfried sets off into the world to perform heroic deeds, sailing down the Rhine. This is one of my favorite passages in the opera. Act 1: During Siegfried's Rhine journey, Wagner cleverly uses different musical themes of the cycle to pretty much give a glimpse of the story, indicating that it's all going to end badly. Siegfried reaches the Gibichung's hall. There he meets Gunther, his sister Gutrune, and their half-brother Hagen. They ask Hagen for marriage advice, and he cunningly sets up an evil plan to get the ring. He tricks Siegfried into drinking a potion which makes him fall in love with Gutrune and forget all about Brunnhilde. To win her, Hagen manipulates Siegfried into forcing Brunnhilde to marry Gunther. Brunnhilde's sister tells her Wotan (leader of the Gods) says the world will end unless she gives up the Ring. Brunnhilde refuses since she loves Siegfried too much. Speak of the devil! Siegfried returns, but disguised as Gunther with the Tarnhelmet. He takes the ring from her and claims her as Gunther's wife. Act 2: It's dawn again, but this time things are very wrong. Siegfried, still in disguise, returns to the Gibichung's hall with the captured Brunnhilde. At the start of the forced wedding, Brünnhilde sees Siegfried there, and with the Ring on his finger! He betrayed her, and she wants revenge. She lets Hagen in on a useful Siegfried-killing tip: the hero has a weak spot in his back, since he's so brave that he'd never run from a fight. One spear in there and he's down! Gunther joins the murder plot too since he likes the sound of the Ring's unlimited power. Act 3: The men are out hunting. Siegfried comes across the Rhinemaidens, who warn him of impending doom, but he ignores them. Hagen stabs Siegfried's back with a spear, but not before giving him the potion's antitode. As he's dying, Siegfried tragically recalls that he was in fact in love with Brunnhilde. The music in Gotterdammerung is amazing. Wagner had pretty much mastered his massive orchestra by this time. The opera contains his freest, richest, most glorious music - the best, I think, he ever wrote! Words really can't describe it, so I urge you to listen to it instead! Wagner also took out two popular passages from Gotterdammerung ('Siegfried's Funeral March' and 'Dawn and Siegfried's Rhine Journey'), edited out the singing, and slapped an ending on them. 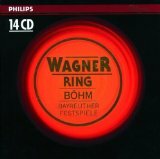 As I mentioned on the Wagner's Ring Cycle page, my favorite recording of the cycle is the 1966 Bayreuth recording conducted by Karl Böhm. The Gotterdammerung in this recording is exceptional - all the amazing colors and energies of Wagner's sound world have been captured. A great experience with top class performers! Click to explore Tristan und Isolde, an earlier Wagner Opera, but with the same epic beauty!